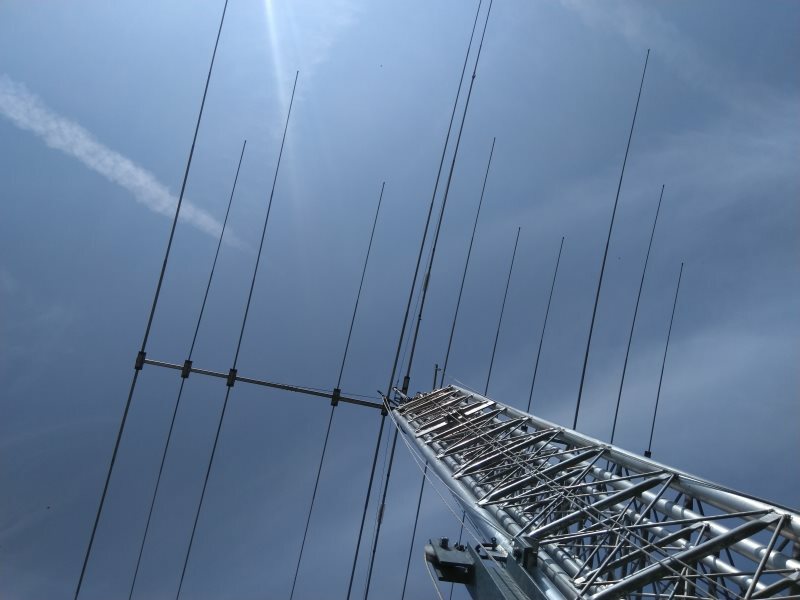 Let’s get one thing straight: The yagi. With respect to the 40m dipole. After the storm that shook things up last month (link). I hate these jobs. I don’t like tower work at all. Even with a tilt over tower. The objects of the interventions (antennas) are still about 3m or 4m high. The problem is not that height. It’s the fact that the antennas are hard to reach from a ladder and there is never a good way to position yourself. While the tower is hanging on a steel cable and a brake winch. To me there is absolutely no fun in this. It’s never easy, it’s always a risk. A scaffold seems to be the only solution to do this right. And something to support the tower should the stainless steel rope break. But it had to be done. I tilted the tower over and yanked the boom a few times until the yagi’s 20m driven element was visually in line with the 40m dipole. After the next storm, I’ll have to repeat this. Rather this than do a permanent fix. Because I really –really- don’t like working on the tower. On the other hand I comfort myself: so far this is the only ‘damage’ a storm has done to my tower, rotator and antennas. Nothing broken, nothing bent. Knock on wood! I did a visual inspection of the rest and found out that the almost fifteen year old strain relief on the cable boom (2 coax + 1 rotator ctrl) had worn out. Cable ties and electrical tape only have so much years exposed to the elements until they snap. So I moved the ladder (hate it!) and came up with an ad hoc strain relief that should be gentle to the cables and keep the bundle in place. I also lubricated the pulleys to hoist up the low band wires. Time to get the tower plumb again. Seems about right, no? This is the closest I seem to come to ham radio these days. Unfortunately.